I’m so tired from pushing to 20 miles today that I just brushed my teeth in my tent and opted to swallow the toothpaste. 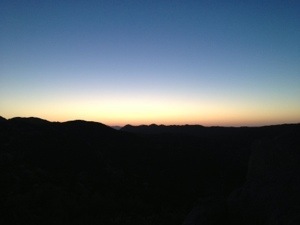 I hit snooze until 5:00am this morning and was on the trail at 6:04am. 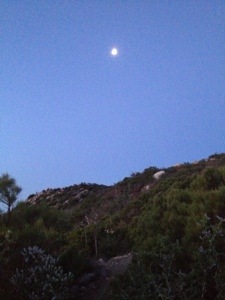 I walked until the sun was almost completely set tonight, some time around 8pm. The day was so long it almost feels like two. Getting up early was a great move and something I hope to do from here on in as the miles are so much easier without the heat. 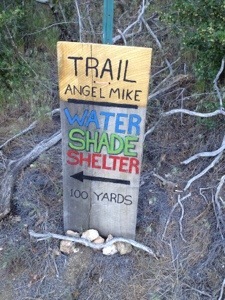 I arrived at my first water source four miles in, a water tank at Mike’s place. There were a few other hikers there including Flipper who didn’t manage to get to the water last night and had to survive on the splash I gave him the night before. 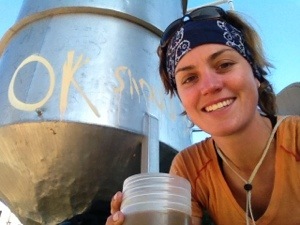 When I went to sign the trail register the woman at the property offered to cook me pancakes but I was keen to push on and make myself a coffee up on the trail. Last night I heard a whole group of hikers go by at midnight. I saw them all this morning at Mike’s and they were stoked to hear about the offer of pancakes. 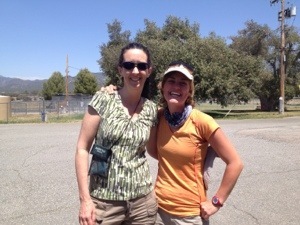 They had started from Warner Springs at 5pm and made it further than I did in an entire day! 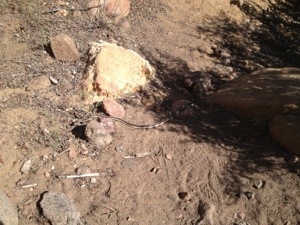 There were more majestic mountain views and wildlife on the trail today including the snake pictured above who was in no hurry to get out of my way, even when I went to prod it with my hiking pole. It finally moved when I threw a stone at it. It was another hot day but my second water source was only 10 miles away so I planned to get there as quickly as possibly and then wait out the heat. Below you can see the trail cut along the mountain on the left. 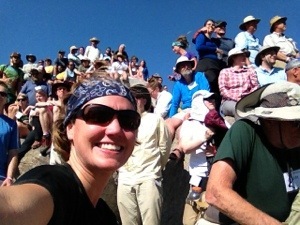 There were even more hikers at the Tule Spring where a huge water tank fed water down to a small hose. I spent three hours laying in the shade, drinking, eating and even sleeping a little. I had to perform surgery on a new blister on my small toe but all in all the feet are doing well. 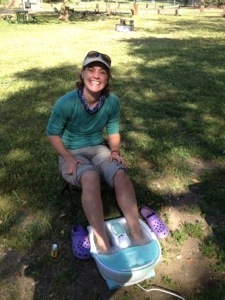 I made a great discovery today of how to soak my feet when there’s no rivers or creeks. 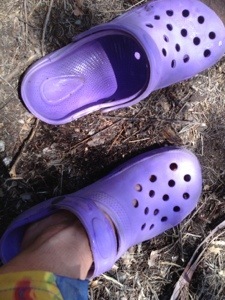 I just pour a little bit of water into my Frocs (fake Crocs) and give myself a foot bath. 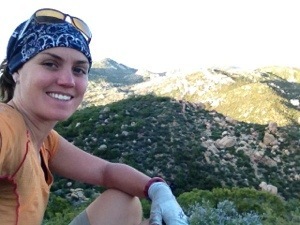 While I was hiking today I thought about all of the comments I’ve been receiving on this blog. It’s honestly one of the best parts of my day when I receive them. Even though I don’t always respond I absolutely love reading them and it makes me feel like I’m not alone out here. They definitely keep me motivated! After a hearty lunch of spam and cheese I was ready for the last 7 miles. I was determined to get close enough to the next water cache but also find a nice place to camp. 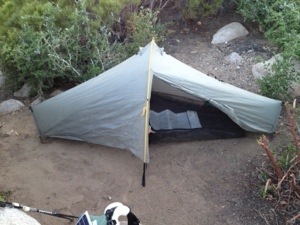 Luckily I was able to do both with just enough daylight to set up my tent. 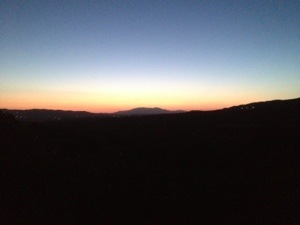 The sky looked a lot like it did this morning when I woke up and started hiking… beautiful! I haven’t looked ahead to tomorrow but because Paradise Cafe is closed on Tuesdays (bummer) I’ll need enough water to go 15 miles. I’m used to carrying way too much so it shouldn’t be a problem. That’s about all I have in me this evening, off to sleep! It only occurred to me when I started looking for a campsite tonight that it would be my first night camping alone. When I woke up this morning Wendy had already packed up her tent and left. I told her I was going to have a slow morning and she wanted to beat the heat. Smart girl!! 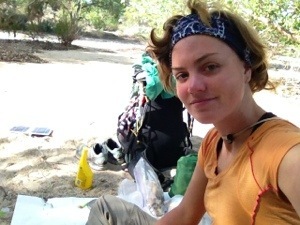 I was up by about 8:30am but by the time I’d cooked up oats and coffee and enjoyed the early morning sun while packing up, it was 9:45am by the time I left camp and already the temperature was getting hot. My feet were feeling pretty good but my lower back and knees started to hurt a little. I guess something will always hurt during this hike. Dr Sole gave me a magic green potion to put on my knees which really helped. I think they use it on horses so it’s pretty heavy duty! 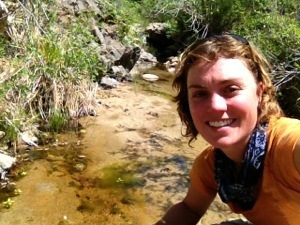 The best part of the day was early on crossing Agua Caliente Creek five times. I found the best spot, took off my shoes and waded in the cool water before filtering enough water to fill my 6 litre capacity. I ate lunch there in the shade before heading on, this is where the walk became very challenging. 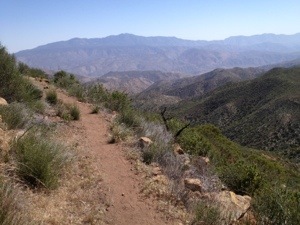 The extra weight and extreme heat were a bad combination, plus the trail went up, up and up for the next 7 miles. It was a good thing I did take the extra water because a lovely girl I met who was day hiking called Katie had run out on her way back to her car. 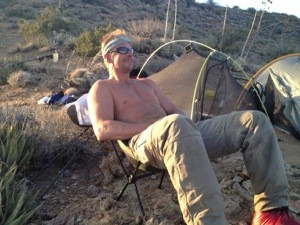 Then later on while I was at camp I met another hiker ‘Flipper’ who had also run out 3 miles from the next source. 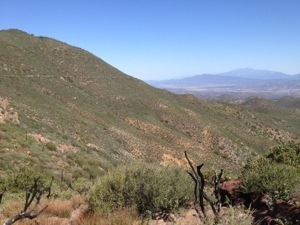 The views were great but I really struggled after four days off the trail. 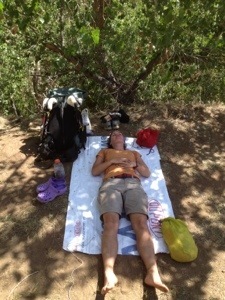 My back wasn’t doing well and at one point I put everything down and just sprawled out on the trail. I stayed in that position until 4pm after only doing about 8 miles. Another mile up I almost stopped to camp except something scurried across the ground and after almost stepping on a snake on the trail today I decided it wasn’t a good spot. This ended up being a good decision as I was able to walk another 4-5 miles before finding a really good place to camp. 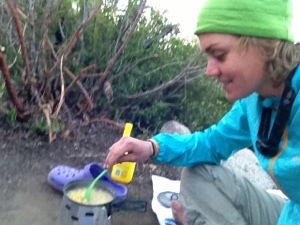 While I was making dinner two hikers passed my tent and we chatted briefly. I wasn’t able to catch up to Wendy but didn’t really expect to after at least 4 hikers passed me today. Ah well no rush. I had mac and cheese tonight and if anything, at least my trail appetite is in good shape. I’m planning to make a very early start tomorrow morning. Ill set the alarm for 4:30am and see how I go. Even after training in the Australian summer heat I’m still struggling with the temperatures out here. Pac Man is still in Idyllwild waiting for his new water filter and Chris is still in Warner Springs waiting for the post office to open tomorrow so he can get his resupply. There’s so many people on the trail now. I even bumped into another of Dr Sole’s patients ‘Road Runner’ and her husband today. 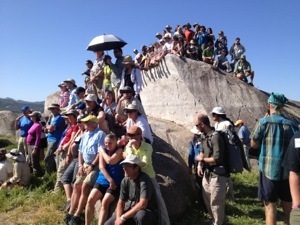 I now understand what they mean when they talk about hiking community. 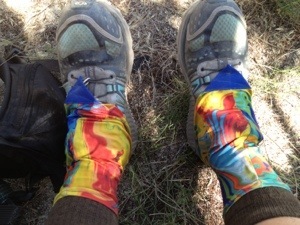 Below I’ve tried adding a panoramic picture of the view from my campsite and also a photo of my new pair of Dirty Girl Gaiters so you can see what they look like! It’s 10:45pm and Wendy and I just set up camp a couple of miles out of Warner Springs. We were happy to leave the kick off a day early and get back to the trail ahead of the pack. Leanne one of Monty’s friends and her partner brought us the 1.5 hours back to the trail head. 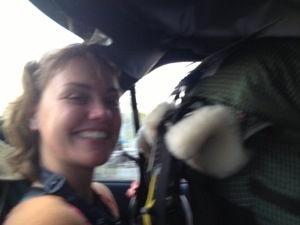 My pack was on my lap in the back seat full of 5 days of food and 6 litres of water making my legs numb for most of the trip. 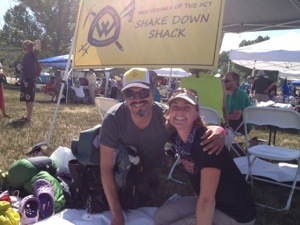 We started the day with breakfast and coffee with Dr Sole before heading over to the Dirty Girl vendor tent. He made us burritos and said we could come back for lunch too. My feet are in such good shape he just did a quick clean and tape up job so no dirt could get in, then I was set to go. Once this was done I spent some time with the Dirty Girls and went to a couple of seminars on food and one for women only hikers. I wasn’t sure I wanted to go to this one and although I was glad I did, I left feeling more vulnerable than before. Some of the women who had done other thru hikes had some interesting stories about dealing with male attention on the trail, and having been at the kick off I now understand what they’re talking about. The good thing is there’s at least 20 other solo women hikers on the trail so I’m definitely not on my own out here. 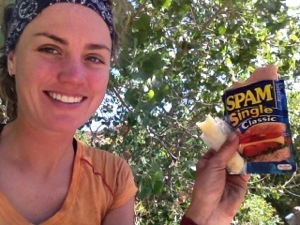 Next up was the class of 2013 PCT hiker photo and then cheeseburgers for dinner. We said a big goodbye to Dr Sole before we left and thanked him so much for all the work he did on my and many other hiker’s feet. I encouraged him to take a short lunch break and brought him some food for dinner as the line up of patients was never ending. He may also be in Kennedy Meadows around the time I’m there, fingers crossed! 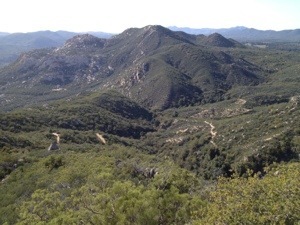 Once we were dropped off back at the trail head we decided to hike some distance from the road. My headlamp was the strongest so I was leading and could see so many creepy crawlies on the trail including spiders, giant black bugs and crickets. After a few minutes of walking we were surrounded by at least ten pairs of giant eyes reflecting in the torch light which turned out to be horses, then I also saw a huge mouse which turned around and ran towards me when my torch light hit it. I screamed and ran in circles then doubled over in fits of laughter with Wendy who also freaked out at the speed at which the mouse charged at me. We decided to find a place to camp soon after. Tomorrow morning I’m going to take it slow and get my bearings again, then start the trail anew as a solo hiker. Pac Man already made it to Idyllwild so he’s at least 4 days ahead of me now. It’s day 2 of kick off and I’m just about done. 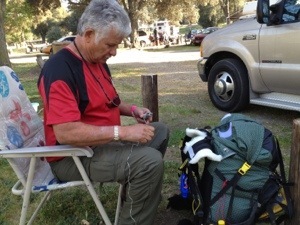 I had the most magnificent pack shake down which consists of an experienced hiker going through each and every piece of your gear to assess whether or not you really need it. I think it was the longest shakedown in history creating a lot of interest from passers by who were amazed at the quantity of items that were being put aside. My clothing, first aid, underwear and toiletries were all closely scrutinised, right down to the one tampon I was carrying if my Diva Cup failed. I’ve never had a male stranger and random onlookers learn so much about me so quickly. 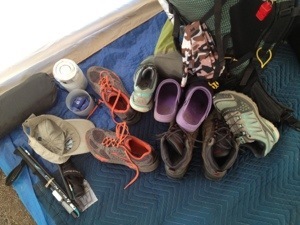 When people saw I had three pairs of shoes I think they were curious to know what else was in my giant pack. In the end I think we managed to cut at least 15 pounds or more. Thank you Virgo for helping me do this! I was fortunate to have time between my Dirty Girl Gaiter duties to attend a couple of seminars on desert hiking and the water report. Tomorrow I hope to learn a little more about snow hiking/camping and post off all the gear that won’t be joining me on the trip. 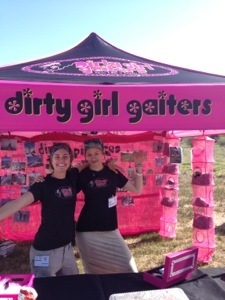 The Gaiter stand was relatively quiet today but we’re expecting things to heat up tomorrow. Could be another busy day. I was put on front gate duty tonight from 8pm until 10pm which meant I missed all the videos from the class of 2012 hikers. Shame. I’m not sure when and how I’m getting back to the trail but hopefully I’ll make it out of here sometime tomorrow or early on Sunday. Dr Sole cleaned up my feet again today and he says I’m ready to walk. He’s also going to make Wendy and I coffee and breakfast tomorrow morning. 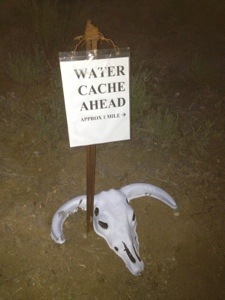 True trail magic which I may need as there’s some serious snoring going on around my tent again tonight. 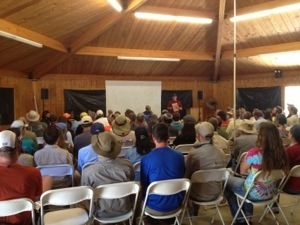 The Annual Day Zero Pacific Crest Trail Kick Off began today. 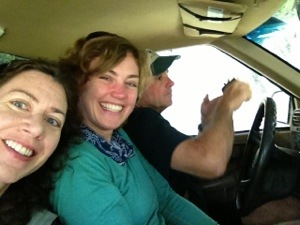 Monty, Wendy and I squashed into the front seat of Monty’s pick up truck and headed back down south just after 9am. 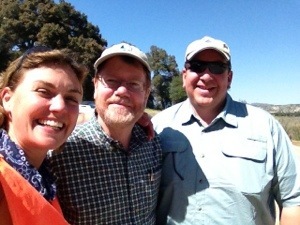 We went past Mount Laguna and I popped into the general store to say hi to the folks I met about a week ago. It was like catching up with old friends, I guess the accent stands out in this part of the world. 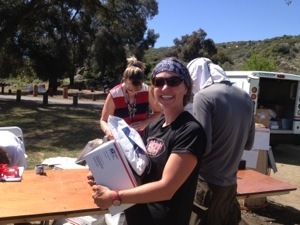 There was already a lot happening on site when we arrived and I was soon put to work at the front gate to welcome the hikers. I met a few more celebs from the hiking world, Halfmile (pictured below) who created the 250 pages of free maps I printed and his colleague who created the iPhone app which I use every time I want to know where I’m at. I looked very official in my orange vest but soon realised I had no answers to any questions making me somewhat redundant. Luckily for me I was introduced to Dr Sole and was relieved of my duties to have my feet seen to by the specialist. After a soapy foot bath my feet were ready for surgery. As Dr Sole lathered my feet in peroxide and started to snip away at the skin I thought to ask if he was actually a doctor. 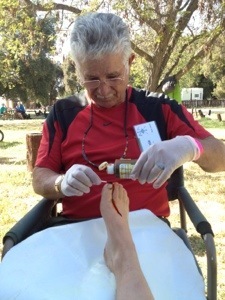 He laughed, shook his head and told me he’s an ex-truck driver who knows a lot about curing hiker injuries. Good enough for me! Not only does Dr Sole cure feet, he also sewed sheepskin to my backpack straps to alleviate my shoulder pain. 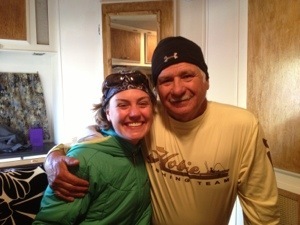 In addition, he invited Wendy and I into his mobile home and fed us cookies and coffee. The generosity of people out here is absolutely overwhelming. Dr Sole also gave me another pair of boots to try. They’re a size 8.5 US and have better ankle support and sole support than my Salomans. I now have three pairs of shoes to test out and choose from this weekend! I participated in the sunset yoga session this evening and am getting an early night as I start working for Dirty Girl Gaiters tomorrow. It’s going to drop below zero tonight so I could be in for a chilly nights sleep! A zero day = no miles walked on the trail. Instead this morning I woke to coffee and breakfast being made, then searched in vain for some sunshine to dry out my feet. No such luck. Instead I read a few pages of ‘Wild’ on my e-reader while sitting on the ground in Monty’s driveway. It was the section where Cheryl is trying to squeeze all the gear into her monster pack in a motel room in Mojave. I loved reading it even more the second time around. As I was reading Billy Goat came over and spoke to me about the Kick Off and was glad to hear I had decided to go. He took Chris in his specially designed car down to Lake Morena today. I decided to stay behind to help Monty get things in order for tomorrow. It was probably the most domestic day of my entire life. I pre-made salad for dinner and learned how to cut with the biggest, sharpest knife on the planet. 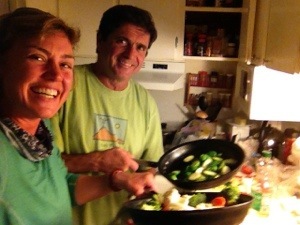 Then I put on a load of laundry, cut vegetables for dinner, washed dishes, moved boxes and cooked. In the midst of my domesticity we took a trip to the Community Centre where I was picked up yesterday to collect another hiker who’ll be teaching yoga at the Kick Off. There were at least 30 hikers hanging out including the infamous ‘Yogi’ (pictured below) who wrote the PCT handbook (my bible). I felt a little out of place and completely out of my element. So much so I expressed my concerns to Monty again about Kick Off, but he reassured me that I’ll be working there, welcoming hikers and helping sell Dirty Girl gaiters to people so it’ll give me a purpose for being there. Monty found me a new pair of shoes in the hiker box today so I’ll test them out over the weekend to see if they make any difference. He also dug deep into my most painful blister again today to ensure there wasn’t anything else inside. I’ve never had so much attention paid to my feet in my entire life. Tomorrow morning we’ll head down to Lake Morena around 9am. I’m still a little apprehensive about being in the company of over 600 other hikers but it’ll be an experience nonetheless! This morning I made the decision to spend a full day off my feet and I THINK I will head to the kickoff. I was lucky enough to score a mattress on the floor inside last night as Pac Man slept outside without cover on the porch. 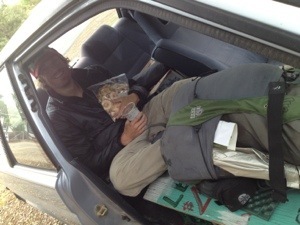 He’s decided to carry onto Idyllwild which I would have done too if my feet were ready for the miles. It was really sad to see him go. 9 days on the trail can seem like a lifetime and I honestly haven’t belly laughed that hard and that frequently for as long as I can remember. Travel safe Pac Man and hope to see you somewhere along the tail. (Check out Pac Man’s website www.crestblessings.com as he’s aiming to raise over 2.5 million dollars for Juvenile Diabetes Research). What this means for me is a day off drying out my feet in the sun then heading back to Lake Morena tomorrow to prep for the kickoff. 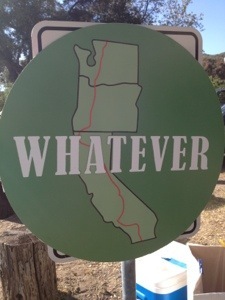 Then on Sunday Monty will drive Chris and I back to Warner Springs where I’ll start off where I left off. I hope this turns out to be a good decision.